Flammable Storage, what is it? Flammable Storage are liquids, solids or gases that must be maintained and stored compliantly. Because flammable and combustible liquids ignite easily and burn easily, they have strict storage requirements by law. Flammable storage must be monitored closely and cannot be taken lightly. In the event of a hazardous chemical fire, flammable storage can increase the risk of other chemical inventory becoming ignited, which can cause damage to facilities and equipment, increase the risk to other chemical inventory being stored nearby, and can create hazardous situations to personnel. It is critical that flammable storage is monitored closely and kept in a safe and compliant flammable storage building. The monitoring of flammable storage is very important because of its instability. Some flammable storage chemicals may become unstable if stored under or above certain conditions. Temperature fluctuations play a major role in flammable storage; some chemicals may have to be kept at certain temperature intervals and some chemicals may require a steady and consistent temperature at all times. 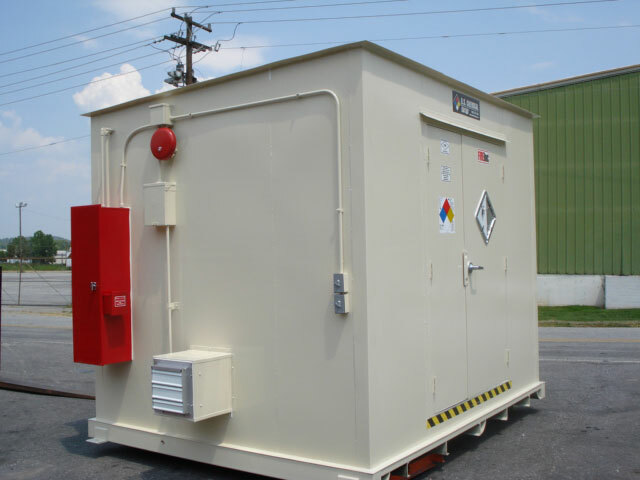 U.S. Chemical Storage provides 100% customizable flammable storage buildings to prevent hazardous situations from occurring. Offering an extensive variety of parts and accessories to store your flammable chemical inventory safely, while providing full compliance with requirements and regulations. Keep your flammable storage maintained and safe with our cooling systems, heating systems, alarms, spill detection, gas sensors, temperature sensors and more. View our Parts & Accessories list for more information on how our custom accessories can benefit your flammable inventory.